Review by AllTheBestFights.com: 2016-07-30, one sided fight between Mikey Garcia and Elio Rojas: it gets two stars. The undefeated former world champion in two different weight classes Miguel Angel Garcia entered this fight with a perfect boxing record of 34-0-0 (28 KOs=82%) while his opponent, the former Wbc Fw champion Elio Rojas, has a record of 24-2-0 (14 knockouts). Both boxers are not ranked as they haven’t fought since 2014: in their last bout Garcia beat Juan Carlos Burgos (=Garcia vs Burgos) while Rojas had won over Robert Osiobe. 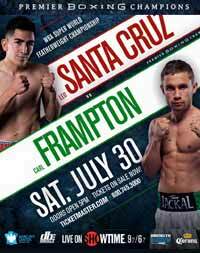 Garcia vs Rojas is on the undercard of Leo Santa Cruz vs Carl Frampton. Watch the video and rate this fight!